Texas power prices spiked Wednesday, briefly reaching almost $1,500/MWh according to Platts, as system demand generated at least two records. The grid operator for most of the Lone Star State, the Electric Reliability Council of Texas (ERCOT), said in a pair of tweets that it set all-time May peak demand records, the last between 5 p.m. and 6 p.m. when demand reached 61.5 GW — more than 2.2 GW higher than the previous May record set last year. As long as weather and operating conditions remain normal, ERCOT expects to reliabily meet demand. 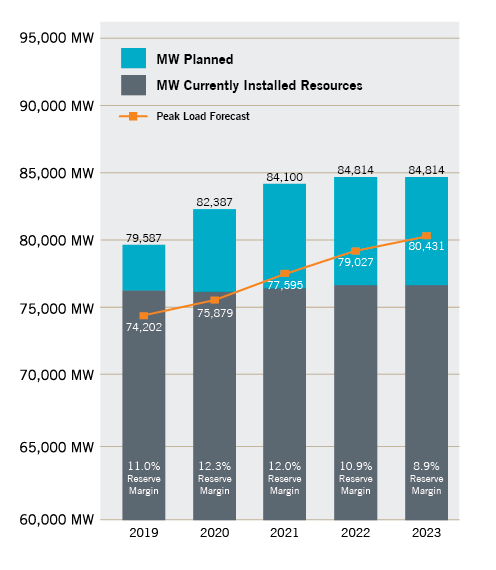 There are 78.2 GW of resources expected to be available on the grid and the recent Seasonal Assessment of Resource Adequacy predicts summer peak load of 72.8 GW. Texas continues to build clean energy resources, including solar, wind and batteries, but heading into this summer, the deregulated market is facing a tight supply-demand balance. So tight that generators that weren’t in use are being dusted off and getting back into the market. “The strong Texas economy continues to drive demand in the ERCOT region,” the operator said in its late-April report on resource adequacy. ERCOT also says it expects more voluntary load reductions and an increase in power sold into the market from industrial facilities in response to high prices. The final summer unit outage total is forecast at 4.3 GW. The operator said reserve margins are expected to remain steady through 2022, and the planning reserve margin for summer 2018 has increased to 11% based on the resource updates incorporated in the final summer SARA report. The reserve margin is expected to peak in 2020 around 12.3%.